Put the soup vegetable julienne into water and cook to receive a so called short broth. 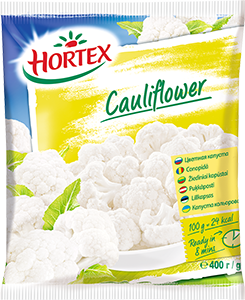 Toss the frozen cauliflower in milk combined with sour cream and add a tablespoon of butter, little bit of nutmeg, salt and pepper and cook slowly until tender. After cooking add the broth and blend. Season to taste with salt and pepper. Blanch the pumpkin cubes and drain off, then spill them on the baking paper, place on them strips of dried ham, sprinkle with honey and bake in the preheated oven for ca. 15-20 minutes at 180 °C. Cut the mushrooms in strips and fry in butter till golden. Cauliflower cream soup serve with hot pumpkin, ham and champignons.